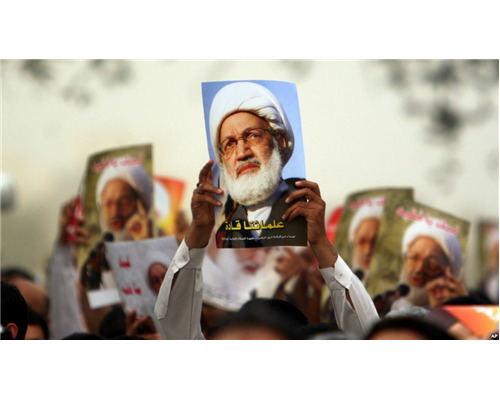 Bahraini people have staged fresh protests across the tiny Persian Gulf kingdom in solidarity with Sheikh Isa Qassim and his supporters. Protesters, carrying candles, took to the streets of the northern villages Abu Saiba and Shakhoura on Sunday night to commemorate Sheikh Qassim's supporters of who lost their lives during a raid last month. Five people were killed and dozens other injured when regime forces attacked Sheikh Qassim’s supporters in the northwestern village of Diraz. The clergyman’s fate remains unknown, with some reports saying he is under house arrest. The scuffles came two days after Sheikh Qassim was handed a suspended one-year prison term and ordered to pay a fine over accusations that he had used his position to serve foreign interests and promote sectarianism and violence. Also on Sunday, people staged a similar protest in Barbar village in northern Bahrain. Regime forces were heavily deployed in the residential areas of Bilad al-Qadim town to confront protesters. Bahraini forces also clamped down on a rally held in the residential area of Sar in solidarity with martyrs. Qassim, the spiritual leader of Bahrain’s main Shia opposition group al-Wefaq National Islamic Society, was stripped of his nationality last June despite denying the allegations.